Electronic Arts bringing version of highly anticipated first person shooter to dual screen handheld. 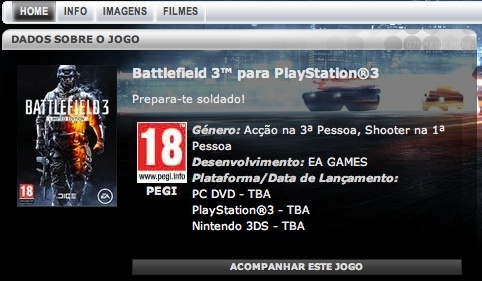 Today, Electronic Arts' Portugal website (AKA EA Portugal) listed Battlefield 3 coming to Nintendo's 3DS. There you go. No info on how close to the console version it'll be, or whether the game will include online multiplayer. For that matter, we don't even know if it'll be a first person shooter. Don't rule out EA trying something different, like a third person or real time strategy game. That said, we'll wait for the official press release for all the details. Meanwhile, come on, Sony. Team with EA to bring Battlefield 3 to PlayStation Vita.